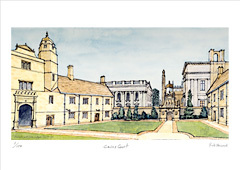 Gonville and Caius is the fourth oldest college of the University of Cambridge. It was first founded as Gonville Hall by Edmund Gonville who was a Norfolk rector but by the 16th century the college had fallen into disrepair. 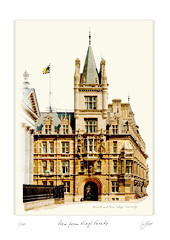 In 1557 it was refounded by Royal Charter as Gonville and Caius College. The college is often referred to simply as "Caius" after its second founder, John Keys, who latinised the spelling of his name to Caius after studying in Italy. Tree Court is the largest of the Old Courts. The architect Alfred Waterhouse replaced the buildings in this Court in 1869 in High Victorian Renaissance style, inspired by the Chateaux of the Loire. The entrance to Tree Court from King’s Parade is dominated by Waterhouse’s ornate Gate Tower.